Sensory tests that numerically present flavour and taste are widely used techniques for the quantitative evaluation of food quality. Recently, attempts have been made to obtain a greater amount of data by combining the results of sensory tests with metabolomics data that provides a comprehensive analysis of food constituents. With increasing amount of data, effective data processing and multivariate analysis become the key part of the analytical workflow. 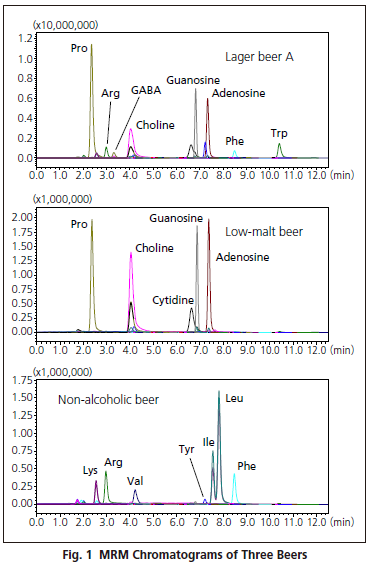 The metabolomic analysis of five commercially available beers using the LCMS-8060 and conditions given in the ‘LC/MS/MS Primary Metabolite Method Package’ is described. Using the data set obtained, efficient data review and principal component analysis was performed by Traverse™ MS Software. The five beers were classified based on differences in constituent compounds and characteristic components in each beer. Hierarchical clustering demonstrated the relative similarities of the beer brands and identified the responsible components. For example, Lager Brand A was more similar to Ale Beer than to another Lager Brand B, and this was largely attributed to adenosine, proline and guanosine content. 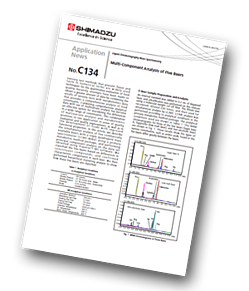 Metabolomic characterization of food/beverage product is increasingly used for assessing food quality. To interpret the data fully for actionable outcome, simplifying data acquisition and multivariate analysis into a standard analytical workflow is needed. Hierarchical clustering analysis provides a visual representation of the degree of similarity between the beers in terms of their constituents. Performing a comprehensive analysis of food constituents in this way and combining it with multivariate analysis makes it easy to evaluate which constituents affect food quality and function.